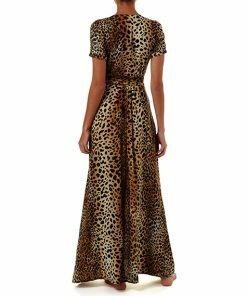 In a graphic floral print named ‘Eden’ the Erin belted kimono maxi dress is trimmed with exaggerated golden trims at the end of the self-tie belt to create shape to the loose-fitting floor-length dress. The Eden boasts dramatic, bell sleeves to compliment the plunging low-neckline. Wear the Eden for a sultry look transporting you from day to night effortlessly.